With approximately six weeks left until the February 2013 LSAT, if you are planning on taking that test you should start thinking about a study plan. Six weeks is a bit on the shorter side as far as study plans go, but it’s doable provided you can devote at least 15-20 hours/week towards LSAT prep. Be realistic – if you are a full-time student or work full time, chances are you cannot spend every waking hour doing Logic Games or Logical Reasoning questions. Nor should you have to; although the number of hours you spend training is surely important, what matters even more is how you train. Here’s what you should be doing, assuming that (1) you aren’t taking a prep course; and (2) you have no prior exposure to the test. 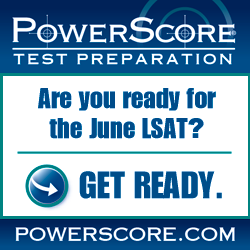 Register to take the LSAT, if you haven’t already done so. The registration deadline for the February 9th, 2013 LSAT administration is January 8th, 2013. Take a practice test under real test-taking conditions (i.e. 5 sections of 35 min each, with one break between Sections 3 and 4). It’s important to add a fifth, “experimental” section to the test you’re taking, even if it means “borrowing” a section from another (older) test. Not only will that help you become familiar with the LSAT format and content, but it will also provide you with a baseline against which to measure your progress. You can use our Virtual LSAT Proctor to time yourself. Purchase the following publications, which we believe are the best self-study LSAT prep guides you will find on the market today: PowerScore LSAT Logic Games Bible (2012), PowerScore LSAT Logical Reasoning Bible (2012), PowerScore LSAT Reading Comprehension Bible (2012). Based on your practice test results, begin reading the LSAT Bible (Logic Games, Logical Reasoning, or Reading Comprehension) that covers the section you did worst on. Go to the Study Plans section in the book website (see the introduction) and begin working on the critical chapters. Do not take any practice tests yet. At the same time, begin reading the Bible that covers your second worst section. If you performed equally on all sections, start with the Logical Reasoning Bible, followed by the Logic games Bible, and end with the Reading Comprehension Bible. Continue reading the LSAT Bibles. Take two full practice tests (ideally from 2009), making sure you take them under timed conditions. Create a Word document or a spreadsheet in which you will list every question you miss on a practice test. Thoroughly review each test and enter any mistakes you make in your Word document or spreadsheet. Identify the type of question it was, and explain, in a few sentences, what made you choose the wrong answer. An entry should look like something like this: December 2006, LR 1, Q1: Main Point. The correct answer is (D), I chose (A). Chose the opposite answer due to competing viewpoints. In the future, pay attention to competing viewpoints in Main Point questions. Based on your performance in Week 2, consider purchasing the Workbooks that accompany the LR and LG Bibles: the Logic Games Bible Workbook, and the Logical Reasoning Bible Workbook. The Workbooks are designed to test and reinforce the concepts and strategies in the Bibles. It’s (almost) like having a tutor design a set plan for hundreds of difficult questions and games. Take three full practice tests, from 2009 and 2010. Thoroughly review each test and enter any mistakes you make in your Word document or spreadsheet. Take two full practice tests, from 2010 and 2011. Examine all the mistakes you’ve made up to this point. Do you see any patterns? Are you missing a lot of questions with conditional reasoning stimuli? Numbers and percentages? How about Undefined Grouping Games? Or Science passages? Keeping track of where you constantly trip up will help you streamline your studies. Return to the Bible trilogy and Workbooks and re-read the chapters that highlight the types of questions and games you are having trouble with. Take three full practice tests, from 2011 and 2012. If you notice persistent patterns of mistakes that you cannot fix with the self-study guides, consider purchasing a few hours of LSAT tutoring. A tutor should not only be able to explain what you are doing wrong, but also help you fix the problem. Tutoring is not cheap, but the benefit usually far outweighs the cost, given the enormous value in salary potential of even a 3 or 4-point increase in your LSAT score. Take two full practice tests, from 2012. In the 3-4 days before the exam, review your Word document or spreadsheet and re-do every question in it, paying particular attention to the flawed logic that led you to choose an incorrect answer the first time around. The day before the test, relax! Do something that makes you happy and don’t worry about the LSAT. Do a few logic games to get your brain revved up. Get to the testing center early.